The Hyundai SUV range just got even bigger. 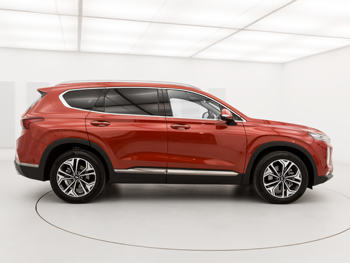 Make way for the all-new Santa Fe, the 4x4 that’s built to last, with seven seats and space for everyone. The all-new Santa Fe delivers adventure and economy. Capable of 47 mpg, it’s equipped with a robust 2.2-litre CRDi diesel engine with options for 6- and 8-speed automatic transmission. All that 4x4 power is balanced with Hyundai’s patented HTRAC all-wheel drive system and cleverly designed front and rear suspension. Inside the all-new Santa Fe, there’s an expanse of seating and legroom that rivals most SUVs in its class. Second-row passengers won’t feel the squeeze with an extra 38mm of leg room, and there’s better headroom and visibility than ever. Add a 547-litre boot that offers 1625 litres with the rear seats folded, and bigger really is better. 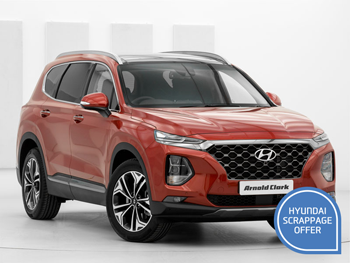 You won’t miss a beat with the all-new Santa Fe’s interior technology, with a driver’s head-up display (available on Premium SE) making access to digital information and navigation a breeze. Elsewhere, one touch access allows passengers on the third row to access with the tap of a finger.